So you have decided to sell your home. Great! Are you worried about how quickly it will sell? Have you spoken to others who have had their house listed for months, even years, without receiving a viable offer? Do not let yourself fall into that trap. Instead, why not get a home staging book that can make all the difference not only in selling your home quicker, but in making a better profit on it, too. There is a lot you need to know about if you are planning on staging a home for sale. 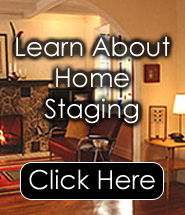 One of the best ways to learn that knowledge is by getting a home staging eBook or two. Take advantage of the years of knowledge and success that have gone into the writing of Decorate-Redecorate books. You will learn everything you need to know about wall grouping design, furniture arranging, color, and so much more. There is also a home staging book that will take you through every room in your house, thereby enabling you to learn the best possible ways in which to make each and every room, hallway or entry way, into a show place all by itself. And if you just love to decorate and are thinking seriously about starting your own decorating or home staging business, then you simply must look through the wide variety of material available and pick out a home staging eBook that is just the ticket for answering all of your decorating needs. You may even want to seriously consider taking one of the courses offered. There is so much money to be made in this particular business. It is truly one of the fastest rising businesses on the market today. Why not take something that you really enjoy and turn it into a way to make money that will have you waking up with a smile in the morning and looking forward to your day? If you are a professional, you can even purchase these guides to give to your customers, many of whom will still want you to do the actual work involved. Yet, it will give them a better understanding of what needs to happen in order to turn their home into a profitable venture. Take a few moments to check out all of the valuable information you can find at www.decorate-redecorate.com. Whether you are interested in decorating and preparing a house, or finding new and wonderful ways to enhance a living space for the holidays and the fabulous parties you will be having, you will find exactly what you need in a home staging book online from Decorate-Redecorate.